I wanted to share my first project as a Creative Cutter Design Team Member. 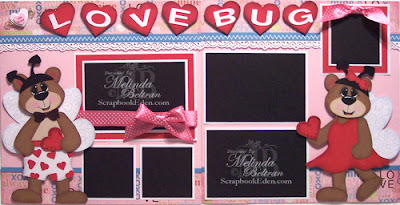 Our challenge theme is Love Bug. Here is a view of my entire layout. I created these adorable “Love Bug” bears for this layout. Here is a close up of the boy bear love bug. Here is a close up of the little girl bear love bug. I added some stickled swirls to their wings and their hearts. Here is a close up shot of the border and title. I inked the hearts and added some more stickles to the letters. I used pop dots to add dimension. I also “Faux” stitched a white zig zag stitch on the blue border. I did also add some wire swirls and tiny foam hearts. I wrote “My Sweet” in the middle of the tiny pink heart with my fuchsia fine tip sharpie. I used and EK Success border punch for the white heart and swirl punch. So now you need to join us in this fun challenge. Just head over to the Creative Cutter Room and enter your project. Be sure to head over as well and take a look at what the other Design Team Members did. Some beautiful stuff! Leave a comment, on that post. Leave a comment on THIS POST and I will pick one lucky winner to receive the Bears as Love Bugs Mini collection cutting file set or digi stamp set that will be released soon. Olive Juice Studio Love Challenge: Use Fabric(my ribbon), Wire (curlies by little foam heart) Hearts and Love either the word a form of it. What cute bears! And your layout is super cute! Thanks for sharing and for the chance to win! Oh Yay. Going to create! Cute, cute, cute! Love the bears and the heart shorts are too cute! The heart boxers put this one over the top- sooooo cute! I love those bears! how do you make them? what do you use to cut them out? I am new to all the cutting out of cute imagines when they aren't on cricut cartridges!!! Just trying to figure it out! Thanks for sharing!! I love this layout the bears are so dang cute!!! Good luck with your challenges! The bear is just too cute! Such a cute layout, I love it. The creative juices are a flowing!!! This is adorable! I love your layout. I love these bears!!! So cute! This is such a great project! Love all the fun details! So adorable! Love the bears, embossing, pretty papers and the title. You always add so much beautiful details! What a cute layout! The boy bears shorts made me laugh. Thanks for sharing! I love love your LO Melin! those bears are just adorable... the bear shorts? adorable!!! love their wings and how you drew their mouth!!!! Love your bears. They are just adorable. As always I love your work. Thanks for the give away. Oh this is so pretty! I simply love your LO. What an absolutely darling layout and I can see what a lot of effort went into its creation. Thanks for joining in our Beary Sweet Challenge, I hope to see you again next time. What a cute layout! I hope you have a wonderful Valentine's Day! Thanks for playing along at the Beary Scrap and good luck! Very cute layout. Love it. You do such awesome and creative designs! Wow what a cute LO. I really like the cutting files and I am excited about a chance to win them. Thanks so much! Oh, my how cute!! Would love to win! I think your files are amazing, but the neatest part is after you put them together, that takes talent!! Love all your projects and I come here for inspiration. Your Bears are too cute! Love the details! The cutting files are great! I love this layout! The bears are adorable. I can just see pictures of my three grandsons (ages 3, 2 and 8 months) on these pages. I would really love to win the cut files for this layout. You are one talented lady! Thank you for all your posts and free files. You are always so encouraging. too cute love your bears. Thanks for sharing your talent and time with us. really adorable layout Melin! The bears are so cute! AHHHHH!!! What cute LUV BUG BEARS!!! Absolutely love it!!! They are adorable...One of the things I miss most about FL is the scrapbooking talent!! and by that I definetly mean your classes and kits! As I continue to unpack scrapbooking bins I am always smiling when I find another kit I bought but didn't have time to do. Recently I completed a ZOO one that everyone who has seen it here in Texas loves it! I am sending them all to your website. What a cute cute layout!!! Thanks for offering it as a prize.